A beautiful early antique enamel advertising sign for Dennifords Soda Water. 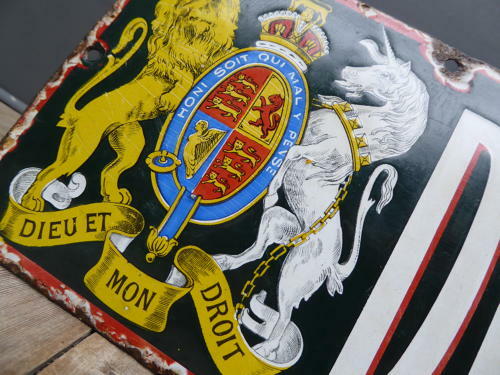 An extremely rare surviving example featuring one of the finest Royal Warrant of Appointment crests you're likely to see on an enamel advertising sign. With wonderful early typography & beautiful overall look about it, simple, striking & just perfect for the kitchen! Wear commensurate with age as pictured. Unrestored.